This product listing is for Volume X: The World Market for Flowmeters Core Study only. To purchase both the Core Study and Module A: Strategies, Industries, & Applications, please see separate product listing. If you would like to purchase Module A separately, please see separate product listing. We completed our first Volume X study in 2003, and published subsequent editions in 2008, 2010, January 2013 and August 2014. We have closely followed the growth in the markets of all the flowmeter types during this time. The main goal of this study is to determine the size of the worldwide flowmeter market, including all technologies, and to see if the trend towards new technology flowmeters continues. This study contains revenue, unit, and average selling price data for all flow technologies, segmented by region. It provides the tools you need to compare market size, market shares, and growth rates for all the flow technologies. It also provides product analysis and growth factors for each flowmeter type. Volume X enables you to assess your competitive position in the flowmeters you supply and the ones you compete against. Market forecasts through 2020 are included. For segmentation breakouts, download the .pdf Overview above. The in-depth research in Module A: Strategies, Industries, & Applications complements and builds on the results of Volume X: The World Market for Flowmeters, 6th Edition. The module can be ordered as a standalone report or as an add-on to the main study. 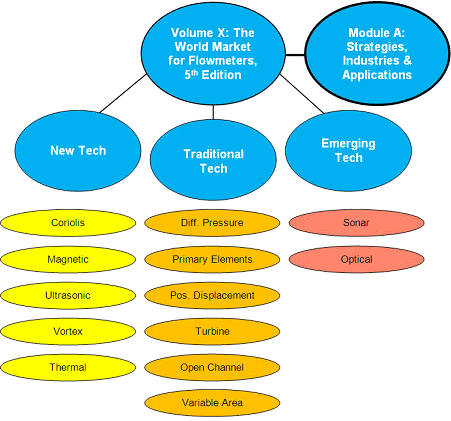 This content-rich module provides strategies for companies already in the flowmeter market as well as those companies considering joining the market. Company strategies apply to the entire flowmeter market, as well as to individual product lines. The module includes tactical and strategic recommendations for suppliers in each market segment. A world view of the market forecasts the best areas for future growth. • Realistic strategies for success for those entering or already in the flowmeter market. For more specific information on both Volume X and Module A, see the Overview at www.flowVolumeX.com.